The Council on American-Islamic Relations (CAIR) describes itself as a “non-profit, grassroots membership organization … established to promote a positive image of Islam and Muslims in America,” to protect Muslims from hate crimes and discrimination, and to present “an Islamic perspective on issues of importance to the American public.” According to the Council’s Director of Communications, Ibrahim Hooper, “We are similar to a Muslim NAACP.” As of June 2007, CAIR claimed 32 branch affiliates in the United States and one in Canada. CAIR was co-founded in 1994 by Nihad Awad, Omar Ahmad, and Rafeeq Jaber, all of whom had close ties to the Islamic Association for Palestine (IAP), which was established by senior Hamas operative Mousa Abu Marzook and functioned as Hamas’ public relations and recruitment arm in the United States. Awad and Ahmad previously had served, respectively, as IAP’s Public Relations Director and President. Thus it can be said that CAIR was an outgrowth of IAP. From its inception, CAIR has sought to portray itself as a moderate, mainstream organization, and as early as 1996 its officials became frequent guests at State Department and White House events. In the aftermath of 9/11, when the Bush administration tried to reassure American Muslims that Islam was not the target of the war on terrorism, CAIR officials were prominent among the invitees. CAIR was the main Islamic group to gain U.S. media access in the post-9/11 period, providing the “Muslim view” of the terrorist attacks and of America’s response to them. As self-acclaimed Muslim spokesmen, CAIR officials typically refused to “simplify the situation” by blaming Osama bin Laden for the attacks on America. Moreover, while they eventually were induced by journalists to condemn Palestinian suicide terror in a pro forma manner, they hedged their disavowals by describing it as an understandable response to Israeli brutality. Contending that American Muslims are the victims of wholesale repression, CAIR has provided sensitivity training to police departments across the United States, instructing law officers in the art of dealing with Muslims respectfully. CAIR endorsed an October 22, 2002 “National Day of Protest” whose premise was: “Since September 11th thousands of Muslims, Arabs and South Asians have been rounded up, detained and disappeared. … Hard-won civil liberties and protections have been stripped away as part of the government’s ‘war on terrorism.’ The USA-PATRIOT Act brings in a new set of repressive laws and restrictions on people and grants even greater power to law enforcement agents of all kinds.” Moreover, this document explicitly defended the convicted murderers Mumia Abu-Jamal and Leonard Peltier, as well as Lynne Stewart and Jose Padilla, who were convicted on terrorism-related charges — depicting all four as persecuted political prisoners of a repressive American government. In February 2003, CAIR joined the American Muslim Council, the American Muslim Alliance, and the Muslim Public Affairs Council in forming a coalition to repeal and amend the Patriot Act — alleging that it violated the civil liberties of Americans, particularly Muslims. CAIR also endorsed the Civil Liberties Restoration Act of 2004, which was designed to roll back, in the name of protecting civil liberties, vital national-security policies that had been adopted after the 9/11 terrorist attacks. In 2003 CAIR invested, according to its own Form 990 filed with the Internal Revenue Service, $325,000 from its California offices with the North American Islamic Trust (NAIT). According to Newsweek, authorities say that over the years “NAIT money has helped the Saudi Arabian sect of Wahhabism — or Salafism, as the broader, pan-Islamic movement is called — to seize control of hundreds of mosques in U.S. Muslim communities.” A recent study by the Center for Religious Freedom found that a very large number of American mosques teach hatred of Jews and Christians, coupled with doctrines of Islamic supremacism. On February 2, 1995, U.S. Attorney Mary Jo White named CAIR Advisory Board member and New York imam Siraj Wahhaj as one of the “unindicted persons who may be alleged as co-conspirators” in Islamic Group leader Omar Abdel Rahman‘s foiled plot to blow up numerous New York City monuments. In September 2003, CAIR’s former Community Affairs Director, Bassem Khafagi, pled guilty to three federal counts of bank and visa fraud and agreed to be deported to Egypt. Federal investigators said that a group Khafagi founded, the Islamic Assembly of North America, had funneled money to activities supporting terrorism and had published material advocating suicide attacks against the United States. Khafagi’s illegal activities took place while he was employed by CAIR. 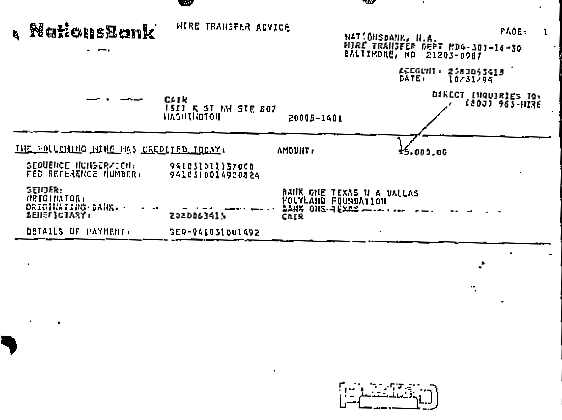 FBI wiretap evidence which was introduced during the 2007 trial of the Holy Land Foundation (a trial that explored HLF’s financial ties to Hamas), proved that Nihad Awad had attended a 1993 Philadelphia meeting of Hamas leaders and operatives who collaborated on a plan to disguise funding for Hamas as charitable donations. CAIR co-founder and Chairman Emeritus Omar Ahmad was named, in the same 2007 Holy Land Foundation trial, as an unindicted co-conspirator with HLF. During the trial, evidence was supplied proving that Ahmad had attended, along with Nihad Awad, the aforementioned 1993 Philadelphia meeting of Hamas leaders and operatives. Moreover, prosecutors described Ahmad as a member of the Muslim Brotherhood‘s “Palestine Committee” in America. The home of Muthanna al-Hanooti, one of CAIR’s directors, was raided in 2006 by FBI agents in connection with an active terrorism investigation. FBI agents also searched the offices of Focus on Advocacy and Advancement of International Relations, al-Hanooti’s Michigan- and Washington DC-based consulting firm that investigators suspect to be a front supporting the Sunni-led insurgency in Iraq. Al-Hanooti is an ethnic Palestinian who, according to a 2001 FBI report, “collected over $6 million for support of Hamas” and attended, along with CAIR and Holy Land Foundation officials, the previously cited Hamas fundraising summit in Philadelphia in 1993. Currently a prayer leader at a Washington-area mosque that aided some of the 9/11 hijackers, he is a relative of Shiek Mohammed al-Hanooti, an unindicted co-conspirator in the 1993 World Trade Center bombing. Muthanna al-Hanooti formerly helped run an organization called LIFE for Relief and Development, a suspected Hamas terror front whose Michigan offices were raided by the FBI in September 2006, and whose Baghdad office was raided by U.S. troops in 2004. In March 2011, al-Hanooti was sentenced to a year in federal prison for violating U.S. sanctions against Iraq. According to the FBI, al-Hanooti also raised more than $6 million for support of Hamas and was present with CAIR and Holy Land Foundation officials at a secret Hamas fundraising summit held in Philadelphia during the 1990s. Randall Todd Royer, who served as a communications specialist and civil rights coordinator for CAIR, trained with Lashkar-I-Taiba, an al Qaeda-tied Kashmir organization that is listed on the State Department’s international terror list. He was also indicted on charges of conspiring to help al Qaeda and the Taliban battle American troops in Afghanistan. He later pled guilty to lesser firearm-related charges and was sentenced to twenty years in prison. Royer’s illegal activities took place while he was employed by CAIR. Onetime CAIR fundraiser Rabih Haddad was arrested on terrorism-related charges and was deported from the United States due to his subsequent work as Executive Director of the Global Relief Foundation, which in October 2002 was designated by the U.S. Treasury Department for financing al Qaeda and other terrorist organizations. During the 2005 trial of Sami Al-Arian, who was a key figure for Palestinian Islamic Jihad in the United States, Ahmed Bedier of CAIR’s Florida branch emerged as one of Al-Arian’s most vocal advocates. In the aftermath of 9/11, federal agents raided the Washington-area home of CAIR civil rights coordinator Laura Jaghlit as part of a probe into terrorist financing, money laundering and tax fraud. Her husband Mohammed Jaghlit, a director of the Saudi-backed SAAR Foundation, is a suspect in the still-active (as of January 2008) investigation. Abdurahman Alamoudi, one of CAIR’s former directors, is a supporter of both Hamas and Hezbollah, and is currently serving a 23-year prison sentence for terrorism-related convictions. Current CAIR board member Nabil Sadoun co-founded, along with Mousa Abu Marzook, the United Association for Studies and Research (UASR), which investigators consider to be a key Hamas front in America. Sadoun now sits on UASR’s board. Current CAIR research director Mohamed Nimer previously served as a Board Director for UASR. One of CAIR’s founding directors, Rafeeq Jaber, is a supporter of Hezbollah and served as the longtime President of the Islamic Association for Palestine. The family of John P. O’Neill, Sr., the former FBI counter-terrorism chief who died at the World Trade Center on 9/11, named CAIR in a lawsuit as having “been part of the criminal conspiracy of radical Islamic terrorism” responsible for the September 11 attacks. CAIR states that it “works in close cooperation with other civic and civil liberties groups such as the American Civil Liberties Union, Amnesty International, Hispanic Unity, Japanese American Citizens League, NAACP, Organization of Chinese Americans, Resource Task Force, and Sikh Mediawatch, among many others.” CAIR also identifies the National Council of Churches as a “partner” organization. On December 12, 2006, CAIR Board Chairman Parvez Ahmed called the war in Iraq a “pure unadulterated projection of raw power” and said the U.S. should withdraw its forces immediately. Another notable CAIR official is Altaf Ali, the organization’s Florida Director. Ali alleges that America responded to the 9/11 attacks by trampling on the civil liberties of all Muslims, and he has wavered on the question of whether or not the victims who died in the World Trade Center on 9/11 could be classified as innocents whose killings were unjustified. In 2007 CAIR became involved in the infamous “flying imams” lawsuit, a case that centered around six Muslim clerics aboard a November 2006 US Airways flight from Minneapolis to Phoenix. Shortly before takeoff, they began engaging in bizarre behaviors eerily reminiscent of those that had been used by the 9/11 hijackers: shouting slogans in Arabic; leaving their assigned seats to position themselves in different places; requesting seat belt extenders that they positioned on the floor, rather than using them to secure themselves. Responding to the concerns of alarmed passengers and the flight crew, authorities removed the imams from the plane. Soon thereafter the imams filed a lawsuit against US Airways, claiming that they had been removed from the flight for no reason other than anti-Muslim discrimination. The lawyer representing the imams was Omar T. Mohammedi, who as of 2006 was President of CAIR’s New York chapter. In February 2007, CAIR endorsed a call by the American Muslim Taskforce for Civil Rights and Elections, for a worldwide “rolling fast” in support of the incarcerated Sami Al-Arian, who had initiated a hunger strike on January 21 to protest his detention and treatment by federal authorities. Participants in the campaign agreed to fast every Monday, Wednesday, and Friday for as long as Al-Arian continued his hunger strike. On June 4, 2007, the New York Sun reported that CAIR had been named as an unindicted co-conspirator in an alleged criminal conspiracy to support both Hamas and the Holy Land Foundation for Relief and Development (HLF). The federal prosecution document, in naming CAIR as an unindicted co-conspirator, described the organization as a present or past member of the U.S. Muslim Brotherhood’s Palestine Committee. Also named as unindicted co-conspirators in the HLF trial were groups such as Hamas, INFOCOM, the Islamic Association for Palestine, the Islamic Society of North America, the Muslim Arab Youth Association, the North American Islamic Trust, and the United Association for Studies and Research. The list also included many individuals affiliated with the Muslim Brotherhood and/or Hamas. Among these were Omar Ahmad, Abdurahman Alamoudi, Jamal Badawi, Yousef al-Qaradawi, Abdallah Azzam, Mohammad Jaghlit, Mousa Abu Marzook, Abdel Aziz Rantisi, and Ahmed Yassin. According to a June 2007 Washington Times report, CAIR’s membership had declined more than 90 percent since the September 11, 2001 terrorist attacks, from approximately 29,000 in the year 2000, to fewer than 1,700 six years later. As a result, CAIR’s annual income from dues dropped from $732,765 in 2000 (when yearly dues cost $25 per person), to $58,750 in 2006 (when dues cost $35). As of 2007, the majority of CAIR’s $3 million annual budget derived from about two dozen individual donors. CAIR has received funding from the Community Foundation for Greater Atlanta, the New York Foundation, and the Tides Foundation. CAIR also receives considerable funding from Saudi Arabia, whose Washington embassy in 1999 announced a $250,000 grant by the Saudi-based Islamic Development Bank to help CAIR purchase some land in Washington, DC — to be used in the construction of “an education and research center.” In 2002 the World Assembly of Muslim Youth, which is bankrolled by the Saudi government, financed CAIR’s distribution of books on Islam and CAIR’s immensely expensive advertising campaign in a number of American publications — including a weekly ad in USA Today which cost approximately $1.04 million over the course of the year. In 2003, Saudi Prince Alwaleed bin Talal donated $500,000 to help CAIR distribute the Koran and other Islam-related books throughout the United States. Two years later, a Saudi Arabian named Adnan Bogary gave CAIR’s Washington branch a donation of more than $1.36 million. In 2006 Sheikh Hamdan bin Rashid Al Maktoum, Deputy Ruler of Dubai, financed the building of a property in the United States to serve as an endowment for CAIR. That property now generates some $3 million annually for CAIR. According to the Investigative Project on Terrorism, CAIR in 2006 sent delegations to Saudi Arabia and the United Arab Emirates in an effort to procure millions of dollars in donations from wealthy Gulf donors. In October 2010, CAIR announced that it was forming a new “Islamophobia” department that would produce an annual report tracking “trends in rhetorical attacks on Islam and Muslims and … offer accurate and balanced information to be used in the struggle for tolerance and mutual understanding.” The CAIR website devotes a section to the concept of “Islamophobia.” CAIR has also released a video titled “Islamophobia: A Growing Problem.” In particular, CAIR has conducted a public-relations war against various Tea Party movements that have hosted speakers which CAIR deems Islamophobic. IslamistWatch reports that CAIR “uses Press TV, the biased English-language channel run by the Iranian government, as a platform to peddle its favored meme of “Islamophobia” in the U.S.” Numerous examples can be seen here. Produced and broadcast from Tehran, Press TV’s hosts/presenters include George Galloway and Tariq Ramadan. Another media outlet that has remained open to CAIR leaders was the Hamas-linked Palestinian network Al-Quds TV. The Center for Security Policy (CSP) suggests that “CAIR talking heads” now must resort to making appearances in such venues because America’s 24-hour cable news networks, uncomfortable with CAIR’s “proven ties to Hamas and [its] unindicted co-conspirator status in the Holy Land Foundation trial,” have become reluctant to feature the group’s leaders in broadcast interviews. In June 2011, the IRS stripped CAIR of its tax-exempt status because it had failed, for three consecutive years, to file required annual reports, known as Form 990s, detailing its revenues and expenses. In October 2011, CAIR’s New York chapter expressed its support for the anti-capitalist movement Occupy Wall Street, which, according to CAIR, brings “into the international spotlight” many issues that “affect Muslim communities disproportionately.” “[I]t is up to us to stand up for our rights and show the world what democracy and peaceful protest look like,” said CAIR. On October 19, 2011, CAIR was one of 57 organizations to co-sign a letter that Farhana Khera, executive director of an Islamic organization called Muslim Advocates, wrote to Barack Obama’s then-Deputy National Security Advisor for Homeland Security and Counterterrorism (and later CIA director) John Brennan. The letter demanded that Obama officials “purge all federal government training materials of biased materials”—that is, materials that they claimed were biased against Islam—and “implement a mandatory re-training program for FBI agents, U.S. Army officers, and all federal, state and local law enforcement who have been subjected to biased training.” Joing CAIR as signatories were such groups as the Islamic Circle of North America, Islamic Relief USA, the Islamic Society of North America, the Muslim American Society, and the Muslim Public Affairs Council. More than once, CAIR has advised Muslims not to cooperate with law-enforcement officials investigating potential terrorism cases. In January 2011, for instance, CAIR’s San Francisco chapter featured on its website a poster that read, “Build A Wall of Resistance / Don’t Talk to the FBI.” In November 2014, CAIR-Florida’s “14th Annual Banquet Rooted in Faith” in Tampa distributed pamphlets entitled “What to do if the FBI comes for you” and featuring a graphic of a person holding a finger to his lips in the “shhh” signal. Another CAIR pamphlet, entitled Know Your Rights: Defending Rights, Defeating Intolerance, featured a graphic of the Statue of Liberty likewise making the “shhh” symbol. Cyrus McGoldrick, a former official of Hamas-linked CAIR’s New York chapter, went so far as to threaten informants, tweeting: “Snitches get stitches.” Zahra Billoo of CAIR-San Francisco regularly tweets that Muslims have no obligation to talk to the FBI and should contact CAIR if the FBI asks to talk to them. In September 2012, Al Sharpton was a guest speaker at CAIR’s annual fundraising banquet, where he called CAIR “one of the most important civil-rights organizations in the United States today.” Also addressing the 2012 CAIR convention was Siraj Wahhaj, an unindicted co-conspirator in the 1993 World Trade Center bombing. Two years later, Sharpton keynoted the 2014 incarnation of this same CAIR event. The letter intimidated the school district into offering an apology. In April 2013, the group’s Michigan branch pushed for public schools in the city of Dearborn to accommodate Muslim students who wished to comfortably pray on school grounds and to allow Muslim students to leave early on Fridays for Jumu’ah prayers. The school superintendant complied. CAIR also sends its own lecturers into the public schools to indoctrinate students with Islamist propaganda and wants Muslim educators to have a say in textbook selection, so as to spin the Islamist narrative in history and social studies texts. For example, on November 29, 2011 at Steinbrenner High School in Lutz, Florida, CAIR Florida executive director Hassan Shibly complied with a world history teacher’s request that he teach more than 400 students not only about sharia law, but also about the mission of CAIR itself. In June 2013, CAIR took an alternate, nondescript name: the Washington Trust Foundation, Inc.
CAIR obtained a 501(c)(4) “social welfare” certification from the IRS in 1994. Contributions to 501(c)(4) organizations are usually not deductible as charitable contributions for U.S. federal income tax purposes. Moreover, 501(c)(4) groups are not required to publicly disclose the identity of their donors, with just a few exceptions. Eleven years later, in 2005, CAIR created what was supposed to be a 501(c)(3) nonprofit “sister” organization known as the CAIR-Foundation, Inc., for the purpose of allowing its American donors to get tax deductions when giving to CAIR. Donations made to 501(c)(3) organizations are deductible to the full extent of the law as charitable contributions. It was not until 2007, however, that the CAIR-Foundation, Inc. officially secured its 501(c)(3) status with the IRS. Then, from 2008-2010, the CAIR-Foundation, Inc. never filed the IRS 990 forms that all 501(c)(3)s are required to file. Thus it was subsequently de-listed—i.e., it lost its 501(c)(3) status—in 2011. Meanwhile, the original 1994 CAIR maintained only one website, which listed itself (incorrectly) as a 501(c)(3) and made no distinction between its 501(c)(4) lobbying arm and its (de-listed) 501(c)(3) non-profit arm. IRS regulations stipulate that while an organization may have both 501(c)(3) and 501(c)(4) related entities, it must maintain a wall between the two—i.e., the entities must have separate bank accounts, boards of directors, financial books, and payrolls. But the two CAIR entities had none of these distinctions. To circumvent U.S. tax laws, said the Daily Caller, CAIR’s 501(c)(4) entity had collected, without making any disclosure to the IRS, millions of dollars in contributions—and tens of millions of dollars in pledges—from large, anonymous donors. After depositing these funds into its 501(c)(4) bank account, CAIR promptly shifted the funds to its 501(c)(3) account, thereby (illegally) allowing the donors to remain anonymous and claim tax deductions for their contributions. Federal criminal statutes refer to this practice as “laundering” of funds.” Laundering foreign funds into a U.S. political non-profit in this manner constitutes a violation of the Foreign Agent Registration Act, a 1938 law requiring “persons acting as agents of foreign principals in a political or quasi-political capacity to make periodic public disclosure of their relationship with the foreign principal.” Similarly, U.S. law prohibits the shifting of funds from overseas in order to avoid reporting them to the IRS. Some of CAIR’s large, anonymous donors were based in Middle Eastern Muslim nations. Among those that gave unreported donations to CAIR during one particular five-year period were: the government of Qatar (which gave $405,000 during those years); the Saudi-based Kingdom Holding Company ($199,980); the Embassy of the United Arab Emirates, or UAE ($219,563); and such additional UAE-based entities as the National Bank of Fujairah ($100,000), the Red Crescent Society ($99,985), and â€¨Bin Hammodah Properties ($44,985). As of September 2013, CAIR had met and coordinated with foreign principals on at least 35 occasions and engaged in more than 100 political influence operations on behalf of foreign principals in the United States. In a move that may have been related to CAIR’s practice of secretly shifting foreign funds between its 501(c)(3) and its 501(c)(4), in June 2013 the organization quietly—with no formal announcement—adopted yet another alternate name: the Washington Trust Foundation, Inc. This appears to have been a sub rosa move that was not intended for public knowledge but was uncovered by investigative journalists. Indeed, CAIR’s website made no mention of the name change, and no web page existed under the new name. The Alwaleed bin Talal Foundation was the top donor to Bender’s anti-Israel “documentary” film, Out of Cordoba. Another large donor of the film was the International Institute of Islamic Thought (IIIT). Another donor was the Alavi Foundation, an Iranian group that had its Manhattan office tower seized by the United States in September 2013, in what prosecutors described as the “country’s largest-ever terrorism-related forfeiture.” According to prosecutors, the foundation was engaged in money laundering for the government of Iran. Yet another donor was the Islamic Society of North America (ISNA), which took an active role in the distribution of Bender’s film. Former ISNA heads and current ISNA representatives, Muzammil Siddiqi and Sayyid Syeed, acted as advisors to the film. In mid-November 2014, the government of the United Arab Emirates (UAE) designated CAIR, the Muslim American Society (MAS), and more than 80 groups from other countries as terrorist organizations. Others on the list included ISIS; al Qaeda and its various branches; the Muslim Brotherhood and its branches; Britain’s Cordoba Foundation; the Muslim Association of Britain; and numerous European Muslim groups based in Italy, Germany, Sweden, Norway and Finland. (a) Apologizes for terrorist groups: Challenged repeatedly to denounce Hamas and Hezbollah as terrorist groups, CAIR denounces the acts of violence but not their sponsors. (d) Includes individuals accused of terrorism: At least seven board members or staff at CAIR have been arrested, denied entry to the US, or were indicted on or pled guilty to or were convicted of terrorist charges: Siraj Wahhaj, Bassem Khafagi, Randall (“Ismail”) Royer, Ghassan Elashi, Rabih Haddad, Muthanna Al-Hanooti, and Nabil Sadoun. (e) Is in trouble with the law: Federal prosecutors in 2007 named CAIR (along with two other Islamic organizations) as “unindicted co-conspirators and/or joint venturers” in a criminal conspiracy to support Hamas financially. In 2008, the FBI ended contacts with CAIR because of concern with its continuing terrorist ties. Moreover, in the hours after the deadly December 2 attack, CAIR held a press conference featuring the family of the killers. In the days that followed, CAIR offered legal assistance to the family, appearing in court to help Farook’s sister, Saira Khan, who was “eagerly awaiting to obtain custody” of the six-month-old baby that Farook and Malik had abandoned before carrying out their attack. In July 2016, CAIR stated that its representatives had had 325 meetings with members of Congress or their staff during the preceding 12 months. The organization also claimed that there had been some 14,000 mentions of CAIR on radio or television since January of that year. As of July 2016, CAIR had 29 offices, and it employed 65 trained spokespeople and 35 full-time lawyers.